About a year ago, while I was passionately immersed in getting the manuscript of my latest book, The Spinning Magnet: The Force That Created the Modern World and Could Destroy It, to my publisher, I found myself with a brief moment to surface and take the temperature of the times. It was shortly after the recent U.S. election and people were unironically talking about alternative facts and asserting that we are living in a post truth world. News was fake. Non-fiction was fiction. Facts, it seemed, could be custom-made. And science was dubious at best, bent at worst, and largely irrelevant in either case. This came as a blow, since facts are my stock-in-trade. I write non-fiction books about science. I have been a journalist for the better part of three decades, again often writing about science. If you make a mistake in journalism, you have to print a correction and don a hair shirt for all the world to see. So the post-truth trope started me thinking. The book I was writing is, on the surface, about electromagnetism, one of the four physical forces of the universe. I approached the subject as if I were, in the words of Stephen Morrow, my editor at Dutton, explaining for the first time what a whale was. I am not a scientist, so I had been swotting pretty hard to figure out that approach. I had dipped my toe in quantum field theory – all those waves and particles with their weird ability to be both at the same time – and barked out a rueful laugh when I spotted a T-shirt that read, “I get science, but quantum field theory is just effin’ witchcraft.” As I tried to discern what physicists know about the magnetic shield that protects our planet from solar and galactic radiation, and what is happening in our planet’s tortured core that may prompt the magnetic poles to switch places, the whole thing started to seem like a muddle with no ultimate truth to it at all. But that does a disservice to the physicists who are working so diligently to figure it out. 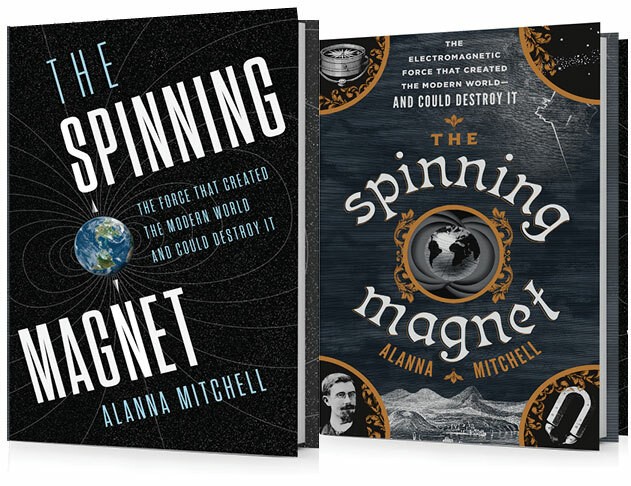 They may not – yet – know everything about how the magnetic field functions, but they know a vast deal more than they knew a century ago. Or a decade ago. Or even just last year. They are making continuous, open-hearted attempts, based on what they already know for sure, to find out more. It’s painstaking and exceedingly careful work. These scientists are not swaggerers. My book – and science itself – is really about the history of ideas and how humans have built up our current body of knowledge, piece by piece over millennia, trying to work out how the universe is organized. It has been a grand game, complete with fits and starts and backtracks and outright mistakes and strokes of genius and absurdly poetic leaps of imagination to catch a glimpse of the rules that govern us all. And those rules are not debatable. They are the truth. Gravity exists. So does the magnet with its north and south poles and the compass that tracks them. So do the two forces that function inside the nucleus of every atom to keep its little bits in the right places. That we know as much as we do about all this is astonishing. And that breathtaking scope of knowledge has led us not to a post-fact, post-truth, science-optional era but to an era that relies extraordinarily heavily on that very science, on those very truths. As I write this, I am on an airplane flying to Sydney, Australia. Our long and honest history of scientific fact-finding feels pretty relevant to me right now: it is keeping me alive 35,000 feet above the ground. It is very much in play in our discourse about nuclear arms and the big buttons that can launch them. It is critical to oil and gas extraction and building luxury towers and even making golf courses green enough. It is certainly key to the technology that has given us Twitter. We do not live in a post-truth world. We live in a world prone to propaganda. This is an ancient, dark art that has disfigured public discourse for as long as humans have been around. It is manipulative. It is deeply cynical. It is designed to untether us from our moral compasses, to sow doubt about whether it is possible to know anything at all. The great task of our age is to reach into our innermost selves, our best selves, quell the noise, and remember that we know right from wrong, truth from lies, just as our planet knows which way to spin.